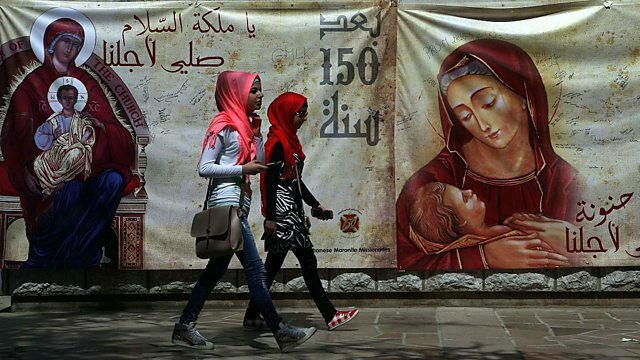 The Virgin Mary and what she means to Muslim in Lebanon. For Christians, the Feast of the Annunciation celebrates the moment that the Angel Gabriel announced to Mary she was going to give birth to the Son of God. In Lebanon, which lives in fear that so called Islamic State will bring its extremism and violence across its border with Syria, the annunciation has become a national inter-religious festival. The annunciation, which is so important to Christians is also part of the Koran as is the Virgin Mary who is referenced in it 37 times, more even than in the Bible. John Laurenson follows the crowds as they celebrate Mary and talk to Muslims and Christians about their, often very warm and intimate, relations with the woman they see as their Holy Mother and the hope she represents for Lebanon.